Last month, China Beat started a feature that asks journalists and China scholars from around the world to write about how China is covered in their home media. 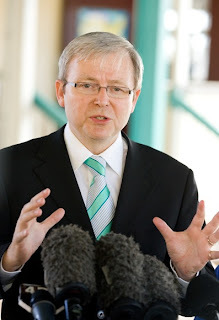 Australia is a particularly interesting case, since Prime Minister Kevin Rudd speaks Chinese and has lived in China as both a student and a diplomat. Here, Rowan Callick of The Australian reflects on Australians' interest in and feelings about China. It’s hard for me to compare how Australians and others cover China, in part because we rarely actually meet each other to swap notes, except for the occasional encounter via the Foreign Correspondents Club of China (an admirable organization, but one without formal standing in China because it lacks—for obvious reasons on both sides—the sponsorship of a party or government body) and in part because the whole structure of journalism in China does not bring reporters together frequently, as it does in most other countries. I sometimes go for weeks without encountering another journalist. For China has few press conferences, parliament sessions (two weeks in a year), company annual general meetings or special meetings (never), court hearings open to the media (in my experience, again, never) that bring journalists together. We tend to do our own thing, often, which—if we are attentive to our audiences—reflects their interests. What, as a result, do I tend to report on? My readers like to see “their” correspondent's name on the big story of the day. So I will cover the major domestic and international events involving China, as other journalists do. I was in Sichuan, for instance, covering the horrific human impact of the earthquake there. But because China has become Australia's top trading partner—and has played a prominent role in driving Australia's continued economic growth, now in its 17th year—I also write substantially on economic and business stories. And there is a constant call for cultural and arts stories, about Chinese writers, film makers and artists. It is hard to write coherently on China today without incorporating coverage of economic development. And Australians are generally interested such issues, aware of the importance of economic openness and engagement, while of course there remain controversies and differences of opinion. About one in every 25 Australians are now Chinese. My wife (a New Zealander) and I have a biological daughter and a Chinese son (born in Hong Kong, whom we adopted while living there), and have only on a couple of occasions had any comments or questions about our mixed family. It’s accepted as normal enough by most Australians. China is widely viewed as an opportunity not a threat—in part because Australia now views itself as an Asia-Pacific country. In recent years, we have had rather more policy disagreements with Europe than we have had with our Asian neighbors. Large numbers of young Australian professionals—lawyers, accountants, journalists, etc.—go to work in Asia, as their parents might have gone to work in London or the US. Our children learn Asian languages—Bahasa Indonesia, Japanese, Chinese, and increasingly the latter—at school. Our daughter, who recently returned to Melbourne after a couple of years here in Beijing, goes to a high school which has a substantial Chinese language center. She wanted to continue playing the erhu (the two-stringed Chinese equivalent to the violin), which she had taken up alongside the violin in Beijing. No problem; the headmistress pointed out that the music staff includes an erhu master from China. So the context of my coverage may be different from that of some other journalists writing for Western media. My readers are also of course interested in human rights issues. I believe I write quite robustly on those, and about the ominous nature of the new surge of nationalist sentiment, for instance. But they are also interested in stories about Chinese culture. I have recently written substantially about Chinese artists, authors, actors, and directors. I have just had a long feature about emerging celebrities in China in our weekly color magazine. I wrote a 2,000 word story on Jiang Rong, the author of the smash hit Chinese novel “Wolf Totem.” I am in the middle of a 3,000 word essay about Beijing, focused on new books about the city, for our literary review. And I am also at present writing about Chinese sports stars in the run-up to the Olympics; Australians are mad about sports, of course. The demands, and the possibilities of having stories published, are actually never-ending. The capacity of our new prime minister, Kevin Rudd, to speak Chinese—the first western leader to do so—was a big plus in his election campaign. He is widely admired for doing so. His predecessor John Howard in part lost his parliamentary seat because a high proportion of the Chinese electors in his constituency shifted to Rudd's Labor party. It makes less difference than I had expected that we have a “Zhongguo tong”—China expert—prime minister, though. It has certainly been no easier than before, to gain access to senior officials—in fact this year, perhaps because of the succession of controversies sta rting with the Tibet riots, it has been harder. His Chinese knowledge is well known here in China—where every taxi driver seems to know of Lu Kewen (his Chinese name)—and in Australia, where media were for a day dominated by his long exchange in fluent Chinese with President Hu Jintao at the Asia Pacific Economic Cooperation forum leaders’ summit in Sydney, in September last year in the lead-up to the election. Rudd talked of his time in Beijing, and his family’s continuing China connections including his daughter’s recent marriage to a Chinese Australian whose family originates from Hong Kong. Rudd has been criticized by political opponents for giving too much attention to China and insufficient to Australia’s oldest Asian partner, Japan. But he has so far avoided taking any serious political damage from being viewed as a sop to Beijing. His Chinese expertise remains for now a net plus for him with Australian voters. Having such China knowledge can, however, cut both ways within China itself. It can become discomforting, having a foreigner somehow inside the comfort barrier. Rudd talked in a speech to Beijing University that made a big impact in April, of being a “zhengyou,” a true friend, one who felt able to talk frankly. He spoke of human rights issues in Tibet—but was rebuked by President Hu during their formal meeting later on that visit. Certainly, having a Western leader speak Chinese is perceived by his Chinese counterparts as giving China face, as reinforcing the country’s “peaceful rise.” But it does not diminish the impact of differences in interests. Indeed, as China and Australia have enmeshed economically, the potential—sometimes realized—for arguments and disagreements has increased. The Rudd government is acting cautiously about China’s rush to acquire ownership of the country’s strategically crucial resources industry. China is reluctant to concede special advantages to Australia’s banks, universities and other service sectors, or to give increased access to Australian farmers, in the talks—which began in May 2005—towards a free trade agreement. Rowan Callick has been the Beijing based correspondent for The Australian since the start of 2006. He was earlier the China correspondent for The Australian Financial Review, then based in Hong Kong, from 1996-2000. He notes that though The Australian’s web site is not always easily navigable or comprehensive, it is free.